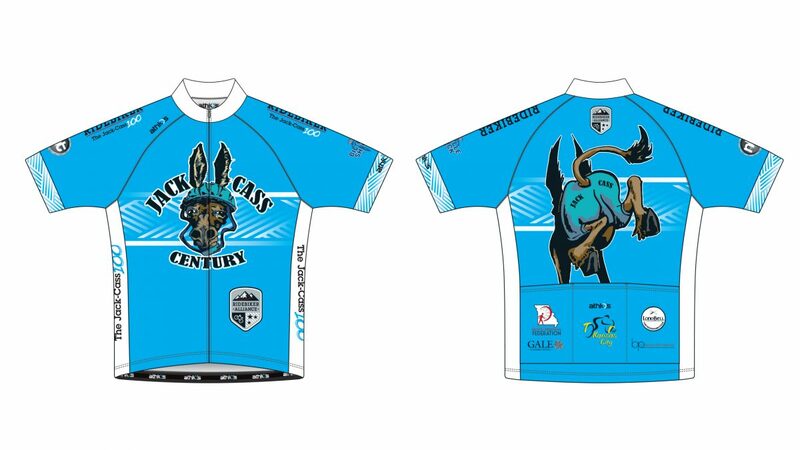 2017 Jack-Cass Century jerseys are ready! Men’s and Women’s jerseys are $65, men’s bib shorts are $85, and women’s shorts, no bib, are $80. They can be ordered through RideBiker.com. If you want to order a jersey and have it here to pick-up on ride day, you MUST ORDER BY MIDNIGHT TONIGHT APRIL 25TH. If for some reason, there are any production delays preventing event-day delivery, the jersey will be sent to your home address. All orders place after midnight, April 25th, will be shipped directly to your home approximately 4-6 weeks after your order is placed. We will be ordering a limited number of jerseys and shorts to have onsite. These are first come, first serve while they last. You will also be able to place an order onsite by filling out an order form and paying with cash or check. If you are ordering in time for the first shipment, you can choose to have it delivered directly to your home, or to us for pick-up at the event. If you are ordering after April 25th you will choose to have them delivered to your home. Outside of those orders delivered for onsite pick-up, we do not personally handle these orders, they are all through RideBiker.com. If you have order questions or issues, please locate contact information through RideBiker.com or your order receipt/confirmation email.